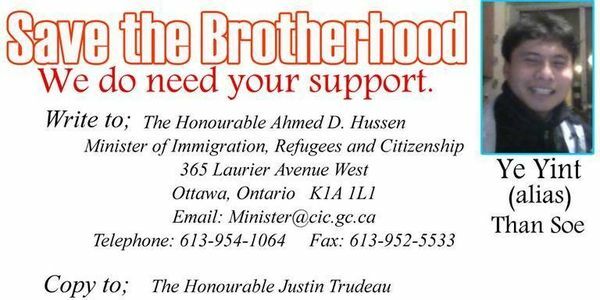 recipient: The Honourable Ahmed D. Hussen ,Minister of Immigration, Refugees and Citizenship ,365 Laurier Avenue West ,Ottawa, Ont K1A 1L1 . With regard to the case of Mr. Than Soe, a Myanmar asylum seeker living in Canada since 2003, I would like to raise five concerns with regard to his potential removal from Canada to Myanmar. These concerns argue strongly against his removal at this time in the absence of guarantees with regard to his security. I would like to start by acknowledging Canada&rsquo;s humanity and generosity in allowing Than Soe to remain in Canada despite his ineligibility for asylum and the complexities of his case. I would also like to acknowledge Than Soe&rsquo;s diligence in adhering to the conditions of his stay and remaining a productive, tax-paying resident. With regard to the case of Mr. Than Soe, a Myanmar asylum seeker living in Canada since 2003, I would like to raise five concerns with regard to his potential removal from Canada to Myanmar. These concerns argue strongly against his removal at this time in the absence of guarantees with regard to his security. I would like to start by acknowledging Canada’s humanity and generosity in allowing Than Soe to remain in Canada despite his ineligibility for asylum and the complexities of his case. I would also like to acknowledge Than Soe’s diligence in adhering to the conditions of his stay and remaining a productive, tax-paying resident. Uneven Reform and Political Uncertainty – Since 2010 Myanmar has been undergoing what has often been referred to as ‘the triple transition,’ from war to peace, military rule to democracy, and from a closed, centrally planned to a market economy. The country has made very significant reform progress since 2012. Areas of progress include the release of hundreds of political prisoners in 2011 and 2012, the freeing of the media in 2012, liberalization of the economy, and free and fair elections in 2015 which saw the opposition National League for Democracy, led by Nobel Peace Laureate Daw Aung San Suu Kyi, win a strong majority. However, the dominant international narrative that basic human and civil rights are no longer a concern because the government is now headed by Daw Aung San Suu Kyi is to overestimate the power of an individual leader, underestimate the long-term institutional decay of decades of military rule, and disregard events in Myanmar since the NLD came to power in April 2016. Any transition as sweeping as Myanmar’s includes stalls and setbacks. In early 2017 Myanmar’s reform process is in a period of stall. As of January 2017 there are 250 political prisoners in Myanmar, up from 64 during the NLD’s first month in power, April 2016. Many are people charged with criminal defamation by officials of the NLD government. End 2016 and beginning 2017 have seen the worst fighting in the country in over a decade, involving clashes between the Myanmar army and ethnic armed organizations in Kachin and Shan States. Armed conflict and the draconian response by the Myanmar military against Rohingya civilians has attracted global attention and stands to have destabilizing effect well beyond Myanmar’s borders. Among the multiple roots of Myanmar’s current instability, two stand out. First the entire security apparatus and several other core state functions remain under the control of the Myanmar military. These functions are not truly under the control of the civilian government led by State Counselor Daw Aung San Suu Kyi. In a context of poor relations between State Counselor Daw Aung San Suu Kyi and the military, the result resembles rule by two governments, creating competition and instability, allowing for a continuation of the abuses of power which have characterized Myanmar’s history. Second Daw Aung San Suu Kyi has been unwilling or unable to provide significant and definitive moral and political leadership on the core issues of human rights, rule of law, and armed conflict. In December 2016, a dozen fellow Nobel Peace Laureates published an open letter denouncing Daw Aung San Suu Kyi’s silence and lack of moral leadership specifically on the persecution of the Rohingya minority, while the UN has issued a report stating that the actions of the Myanmar army in Rakhine State may amount to crimes against humanity. Indicative of the current policy incoherency and political uncertainty, foreign direct investment has fallen and economic growth has slowed in 2016. In the long-run Myanmar is likely to right itself and continue on a path of economic and political reform, however currently the overall context in Myanmar is one of increasing, rather than declining, conflict, wavering on reform, and political instability. Human Rights and Weak Institutionalization of Rule of Law – Should he return, Mr. Than Soe could be charged under numerous laws. Any one of these charges could insert Than Soe into a very weak justice system in which fundamental rights of defense are not consistently available. As has been exhaustively documented, Myanmar had for decades one of the worst human rights records in the world. According to the most recent general report of the UN’s Special Rapporteur of the Human Rights Council on the situation of human Rights in Myanmar, the country’s justice institutions remain very weak. During long military rule (1962 – 2010), the justice system was deeply degraded, functioning as an administrative agency of the government rather than an independent branch. In practice the judiciary does not function independently, there is no ministry of justice, and much of Myanmar’s legal code dates from the colonial era. Military era laws remain on the books, even if their enforcement has been selectively suspended. The Penal Code dates from 1865. A recent report by the British Council details the weaknesses in Myanmar’s justice system, the common understanding of the legal system as an enforcement mechanism, not a means of defending rights, and the difficulty of pursuing court action. To date there is only one documented instance of someone attempting to sue the government. According to the World Justice Project’s Rule of Law Index, Myanmar ranks close to the bottom, 98th out of 113 countries. In addition to affecting the everyday lives of Myanmar citizens, the weakness of rule of law has been demonstrated in prominent cases involving the murder of journalists. Nothing demonstrates the perilous absence of rule of law and guaranteed rights than the assassination on January 29, 2017 of the country’s most prominent constitutional and human rights lawyer, U Ko Ni, legal advisor to Daw Aung San Suu Kyi and the NLD. Should Than Soe return and be arrested, there is no guarantee that he would receive a prompt and fair trial or access to competent defense. Further if he is unlawfully detained, he would not have access to any means of redress. There is no denying fact that the general sense of improvements has already emerged in the country under the civilian leadership. However, the military is still in full control of very critical ministries and the elected body has still been encountering a wide array of challenges, especially in the areas of protecting human rights, adopting democratic principles, and implementing justice and rules of law. “The Myanmar Army detained Par Gyi, 49 years old journalist, on 30 September 2014. Five days later, the journalist was shot to death. Autopsy reports showed that Par Gyi was tortured before he was killed”. “ It’s totally unacceptable, said Myanmar’s incoming information minister Pe Myint on the court recommendations to close the case of a freelance journalist who was killed while in military custody in 2014” [Southeast Asian Press Alliance (SEAPA), March 30, 2016: https://www.seapa.org/courts-drop-par-gyi-murder-case/ ]. A reporter working with Myanmar’s Eleven Media Group was killed in the northwest of the country in late 2016. [Asia Correspondent: December 13, 2016: https://asiancorrespondent.com/2016/12/burma-journalist-killed-reporting-illegal-logging-monywa/]. A recent report from a local newspaper in February 2017 showed that a Myanmar man who starred in Rambo V movie was arrested and has still been held in prison for his role in the movie. These are only selected few of a number of cases in Myanmar. Among them, only a handful of cases targeting rights promoters have been investigated. In many cases, the perpetrators have never been brought to face justice. Rights promoters, democracy activists, and land rights defenders for the farmers have still been threatened and arrested even under the new administrations. Few Returns - Relatively few political exile or refugees have returned since the suspension of the blacklist at the end of 2012. Over 100,000 refugees remain in camps in Thailand, and few have moved to return. UNHCR originally estimated that there would be 15,000 refugee returns in 2016, only 71 returned. Originally 191 had signed up to return, but many were deterred by the lengthy pre-departure screening process in the camps carried out by the Myanmar authorities. The screening was to determine whether the refugees were Myanmar nationals and eligible for return. It involved over 20 representatives from four ministries and union, state, and local government. A recent survey determined that 80% of them do not want to return, citing concerns over safety and security. Among political asylees in third countries, only a small number have returned to live and work but the vast majority remain in the country of resettlement. Although the government has changed, the repressive state apparatus and security concerns which motivated departures in the first place to a great extent remain in place. Lack of Precedent – Among those who have returned, there is no precedent for a case like Than Soe’s, i.e. involuntary removal from a country of sanctuary back to Myanmar for someone without identification or papers from any nation. Among the political exiles who have returned from third countries, all but a handful have done so with the protection of citizenship from a third country, i.e. the United States, United Kingdom, Australia, or the Nordic countries. The dozen or less known political exiles who have returned and reclaimed Myanmar citizenship are very high profile figures who received assurances from the highest levels of the previous government led by President Thein Sein (2011 – 2016) Two were graduates of Harvard University’s Kennedy School of Government who served as advisors to President Thein Sein. Nonetheless in both cases the difficulty of reclaiming Myanmar citizenship still required intervention from the highest levels of government. Superficially the case of Mr. Soe Myint who hijacked a plane from Thailand to India is similar. However at the time of his return to Myanmar from India in 2012, Soe Myint was the editor of a well-known and highly critical news magazine, Mizzima, published out of India. He wished to return to Myanmar and, as a high profile exile editor, was courted by the Thein Sein government as part of its effort to gain credibility domestically and internationally. In sum there is no political exile with a record like Than Soe’s who has returned to Myanmar without the protection of third country citizenship or a high profile. Finally, the situation of foreigners and returning exiles themselves has become more difficult since the NLD took power in 2016. There is currently a bill before the national parliament that would severely curtail the movement and residence of foreigners in Myanmar. If passed it would require, for example, that foreigners register in their townships of residence and inform the local authorities of any movement outside of that township within 24 hours. As of this writing the bill is still under debate. Absence of Guarantees of the Right to Citizenship – Than Soe has no guarantee of obtaining the rights of Myanmar citizenship. Myanmar maintains a system of population control and surveillance that has its roots in the colonial and military eras and has remained unchanged. Every individual is required to be registered as part of a ‘household list’ maintained by the Ministry of Immigration, Population, and Labor. This registration occurs at birth or when someone moves in to join the household. However for those moving to join the household, i.e. spouse, adopted child, or relative, officially two year residency is required before they are considered to have ‘registered’ as part of the household list. Further all records are paper based, so to obtain a copy of a household registration one must travel to the township of birth or last registration. In other words Myanmar treats internal migration and movement the way that many countries treat immigration. Only after becoming part of a household list can individuals obtain a National Registration Card (NRC). This NRC card functions as a national ID card. It is required for movement around the country, including purchase bus, train, or plane tickets, employment, or accessing services. It must be shown at any checkpoints or to any officials who ask to see it. It is also required to access health, education, or other services. Myanmar has a complex hierarchy of citizenship and it is possible to have an NRC but still not be a full citizen. To exercise the rights of citizenship such as voting or obtaining a passport, the Citizenship Scrutiny Card (CSC) is required. To obtain a CSC an individual must be registered, have an NRC, and undergo screening to verify eligibility for citizenship, typically demonstrating multi-generational presence in Myanmar through household lists. It is not clear how Than Soe would obtain an NRC and CSC. He has not been part of a household list in Myanmar for 27 years.Because of the lack of precedent it is not clear that an NRC or CSC would be granted to someone with Than Soe’s background. His forced removal to Myanmar could result in him effectively becoming stateless, with neither Myanmar citizenship nor permanent residence in another country.